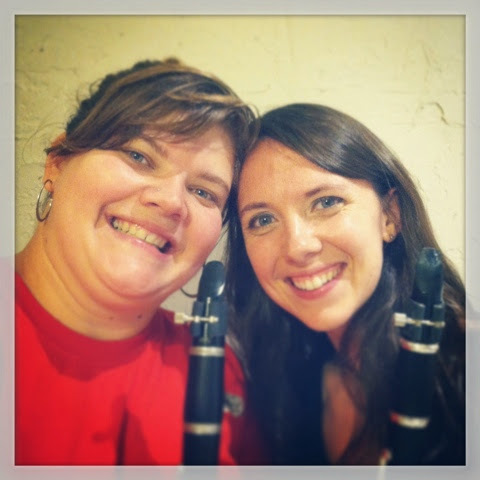 "This is so dorky," I said to Heather as we sucked on reeds and pushed clarinet pieces together. "Yeah, I know," she answered, "Everyone I who I told that we were doing this tonight told me I was a nerd." Nearly ten years had passed since our duo performed together, but last night, Heather and I reunited for a Friday night filled with baked goods, chardonnay, and clarinet duets. The sounds of woodwinds on a Friday night was remniscent of days gone by, but now instead of studying, practicing, and homework, we found ourselves facing bigger life issues - family, marriage, parenting. Oh, how I wish I could tell eighteen year old me not to be so stressed out all the time, the best is yet to come. I guess I'd have to tell her worse is yet to come, solfege is NOT the biggest problem you'll ever overcome, but hey, the shadows prove the sun shines, right? We warmed up with a Mozart piece. Predictable, measured out, tricky at spots, attainable, but just a little boring. Next came the piece that we were *pretty sure* was from our recital days. The smooth legato half notes gave way to a moving melodic line, and after the first phrase, I wasn't sure if I remembered the tune. A smear of black caught my eye, and a slight dread crept up in my stomach as I saw the run of sixteenth notes that I was quickly approaching. And then in an instant familiarity kicked it. My fingers ran up those sixteenth notes in perfect parallel thirds with my duet partner, and in an instant I was transported to Lyte Auditorium circa 2001. Just like in the movies, logically I knew I was currently in Heather's living room playing clarinet, but another scene played out in my head where I was sitting in a ballgown, under the spotlight, sound resonating and bouncing back at me in a room made to seat hundreds. It feels like it was a lifetime ago, and yet, at the same time, it felt like home. In that moment I was so grateful for the time, the years, the teachers, the practice, the performance, the learning. To learn to perform, understand, and love music cost so much time, energy, focus, and even money, but last night I realized (again) how well spent it was.